Today we start a series called “Engines You Should Know” in an effort to enlighten the world about the best, worst and most notable powerplants ever used to propel automobiles. In the first installment, I’ll talk about one engine that doesn’t get nearly enough credit: the Vortec 4200 inline-six found under the hood of the Chevrolet Trailblazer. What Are Some Recent Cars That History Has Already Forgotten? 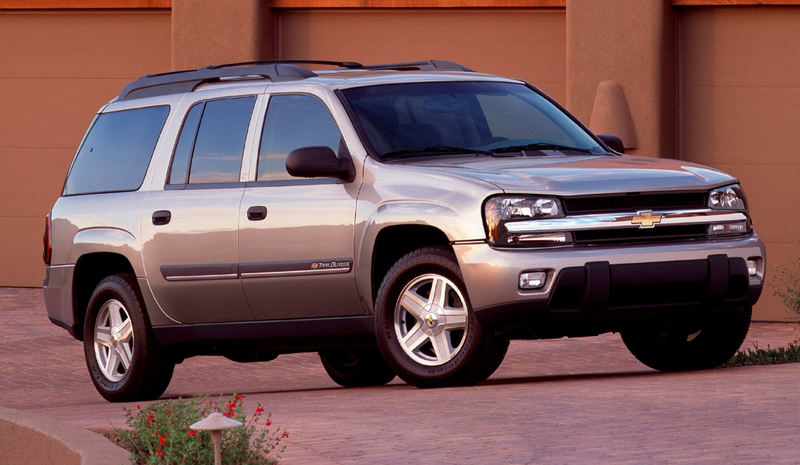 It shouldn’t be that way, because the Trailblazer and its relatives have one key ingredient that make them worthy of the Jalopnik Weird Car® stamp: a 4.2-liter inline-six engine. Thirty years ago, this might not sound remotely interesting, as back then, quite a few cars sported straight-sixes. But now inline-sixes are all but extinct in the truck and SUV segments, having been replaced by V6s for packaging reasons as front-wheel drive became more prominent. Long a mainstay in engine design, the inline-six has largely become relegated to BMWs, although Mercedes-Benz is bringing them back. Almost the entire automotive world has defected to the V-6 layout, largely due to...need for more frontal-area crush space to comply with tougher safety regulations and a trend toward vee-engine modularity. In fact, if you look for an American-market SUV or truck with an inline six gas engine, you’ll struggle to find anything available in the last decade. Except for, of course, the Trailblazer. That Vortec 4200—launched on the Trailblazer, Bravada and GMC Envoy in 2002—was the first engine in the Atlas family of inline-engines, which included straight-five and inline-four engines later found in the Chevrolet Colorado, GMC Canyon, and Hummer H3. All engines in the Atlas family were built entirely of aluminum, and shared piston designs, connecting rods and a number of other components. They all had a 10:1 compression ratio, dual overhead camshafts, four valves per cylinder, electronically controlled throttle bodies, and infinitely variable exhaust cam timing. When it debuted for 2002, the LL8, as the inline-six version was called, made a whopping 270 horsepower from 4.2-liters of displacement, and 275 lb-ft of torque, 90 percent of which Wards Auto says was available at 1,800 RPM. Even more impressive is that the horsepower figure went up to 275 in 2003, and then cranked all the way up to 291 in 2006. Compare that to Jeep’s pushrod, cable-throttle operated, similarly-sized inline-six found in the Wrangler, which could only muster 190 ponies, and you’ll begin to see why the Vortec 4200 won so many Ward’s Ten Best awards. Oddly enough, the LL8 never made it into any other GM product besides the Trailblazer and its siblings on the GMT 360 (and the stretched version, the GMT 370) platform, and in 2009—the final year before the front-drive second-generation Chevrolet Equinox and its Theta platform siblings took over the mid-size SUV space—the Vortec 4200 gave its final bow. Despite the awards, the Vortec 4200 hasn’t gotten the recognition it deserves from the public, in part because its fuel economy was actually worse than that of the more powerful 5.3-liter V8 offered on the Trailblazer and other GMT 360 vehicles at the time. The Vortec 4200 stuck around as long as it could, but like all the wonderful inline-six engines car enthusiasts now yearn for, it was replaced by a V6. Maybe one day the car gods will return that smooth, balanced engine configuration to our mid-size SUVs. We can only hope. Got a suggestion for Engines You Should Know? Tell us in the comments.